Did you get stuck last week? I didn’t, but I helped a few people who were. Thursday our neighborhood Facebook page was filled with requests for assistance at our multiple subdivision exits as people who were stuck in the snow. Getting stuck is no fun. It often feels like an emergency and all your mental energy goes to figuring out how to solve the problem you’ve now found yourself in. It’s a great metaphor for our spiritual journey as well. We sometimes use different words to make it sound more “spiritual” as we say we’re “in a valley” right now, or we’ve found ourselves “plateaued in our faith” but the truth is we’re just stuck. 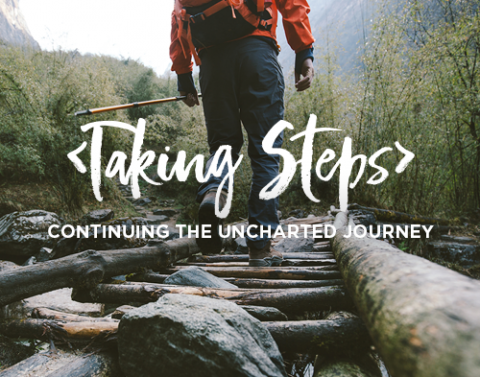 As a church, we set out on a new journey last year called “uncharted” which was all about challenging ourselves to trust God and rely on Him more than we ever have through radical generosity. This month marks the half-way point in that 2-year journey and we want to spend the next five weeks re-engaging that journey because, frankly, you might just be stuck. Some of us are stuck because we don’t even really know what this is all about – we came to the party late and we’re still trying to get the lay of the land. This series will be so helpful for you to join us! Some of us are stuck because keeping our commitment has been exceptionally challenging – we’ve been pretty close to just giving up altogether. This series will be important for you to hear what God is saying to you right now. Some of us are stuck because our commitment hasn’t challenged us the way we thought it might, or the way we now see it could. This series will important for you to see where God is leading you next. No matter where you are stuck today, we want you to take steps into tomorrow. This is the biggest thing we’ve done as a church and I’m hopefully that you’ll make it a priority to engage this conversation with us over the next five weeks. Each week we’ll be showing some new testimony videos, we’ll be digging deep into what God says about being stuck through the book of James, we’ll provide you journaling, discussion and group questions you can use to engage God’s voice in your life. We have a lot going on together! Additionally, I’ll be giving you a different update each week on where we’ve been with our three uncharted priorities: Next generation ministry, church multiplication, and purchasing property for a future facility. I hope you can make it because there will be so much you don’t want to miss! Thanks for being a church that hears God’s invitation and responds so well! We are all taking steps on our way back to God and I’m grateful to journey with you!